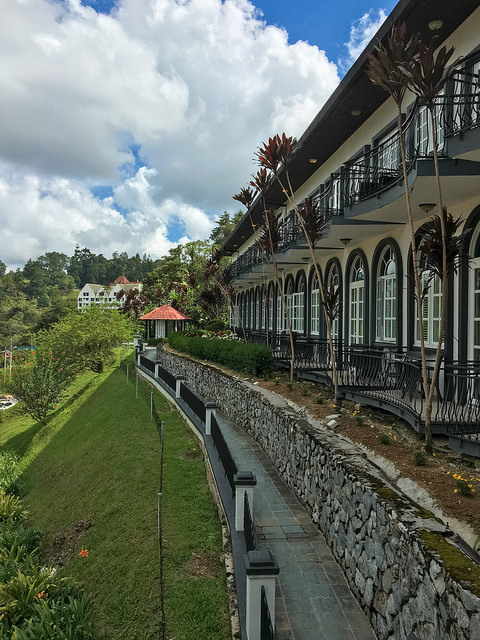 Strawberry Park Resort Cameron Highlands perched atop a 7-acre hill overlooking the panoramic town of Tanah Rata. One can escape from city’s hustle and bustle in Strawberry Park Resort with the clean and fresh air with a touch of blossoming flora and lush greenery tropical forest. Traveling time varies depending on your starting driving point. The quickest route to get to Cameron Highlands is via the North-South Expressway (NSE). Strawberry Park Resort is an ideal destination for leisure and business purposes. The resort houses 118 luxurious and elegantly decorated rooms with an attached balcony to enjoy the panoramic view surrounding the resort. The rooms were designed based on a simple concept – to ensure the guests are comfortable throughout their stay in the resort. The rooms in Strawberry Park Resort are fully furnished IDD telephone system, colour TV, in-house movies, refrigerator, coffee and tea making facilities, as well as personal safety deposit box. Guests can choose from different apartment types offered by the resort that includes one bedroom studio, Tioga apartment, Fresno apartment that houses two bedrooms, Shasta apartment with three bedrooms, Tioga suite, Fresno suite and also Shasta suite. Strawberry Park Resortt also offers optional tours for guests that starts from RM27 for adult and RM19 for children below 12. Guests can choose to join either countryside tours that last for 4 hours or Brinchang Hil and Tea Estate tour that also takes up to 4 hours. The resort is complete with an array of F & B outlets serving mouth-watery and delicious local and Western cuisines in Tudor Grill, Strawberry Court Thai Restaurant, Tudor Lounge, Lobby Bar, Jim Thompson Terrace and also Lip’s Disco. A quiet meal at Tudor Lounge with performance from live band will brighten up your day. Guests can enjoy scrumptious Thai meal in the Strawberry Court Thai restaurant while those like to have a sip of drink before and after dinner can unwind in Lobby Bar. Strawberry Park Resort is also an ideal destination for business travelers to hold a meeting, conference, conventions and seminars as it houses a multi-purpose hall that can accommodate up to 200 guests which is complete with audio visual equipments to facilitate during the presentations. Besides the multi-purpose hall, the resort also offers an Aliso Room and Board Room. Other recreational facilities offered by the resort includes an indoor swimming pool, children’s playground, tennis court, jogging track and golf field. Besides using the recreational facilities provided by the resort, guests can also spend their time to unwind and relax in the nearby attractions such as Boh Tea Estate, Butterfly Farm, Wild Orchids Farm, Vegetable and Fruits Farm, Cactus Valley and also one of the most happening night market in the area which is situated at Brichang town. Grab the opportunity to shop and purchase local handicrafts and souvenirs besides trying local delicacies. A reminder for first-time visitors, remember to try the delicious fresh smoke meat from Malaysia’s First Smoker famously known as Smokey Bear. So plan your holidays ahead at Strawberry Park Resort Cameron Highlands! Address: P.O.Box 81, Lot 195 & 196, 39000 Tanah Rata, Cameron Highlands, Pahang.